Anchoring of lead to refers to suturing of the lead sleeve in a correct manner to prevent slippage of the actively fixed lead. The sleeve anchors the lead to the pocket floor and prevents it being pulled out. The sleeve does this by gripping the lead body and holding it down to the pocket floor via sutures. 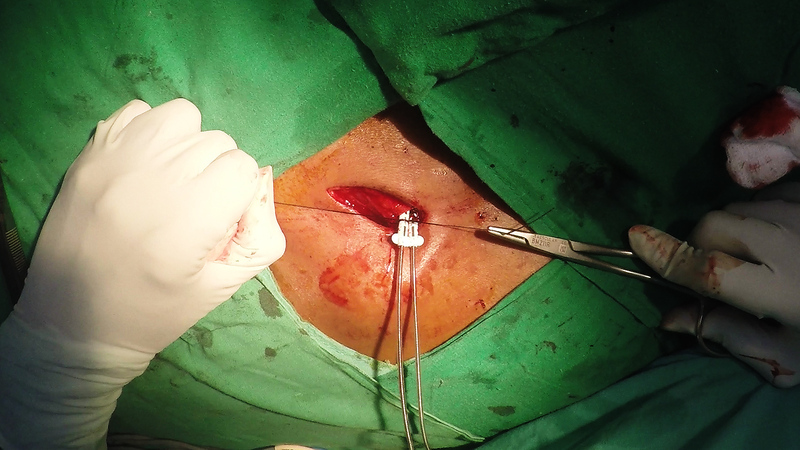 After about 6 weeks following implantation a robust layer of tissue forms around the device and the adjacent lead which is termed as the capsule of the pocket. 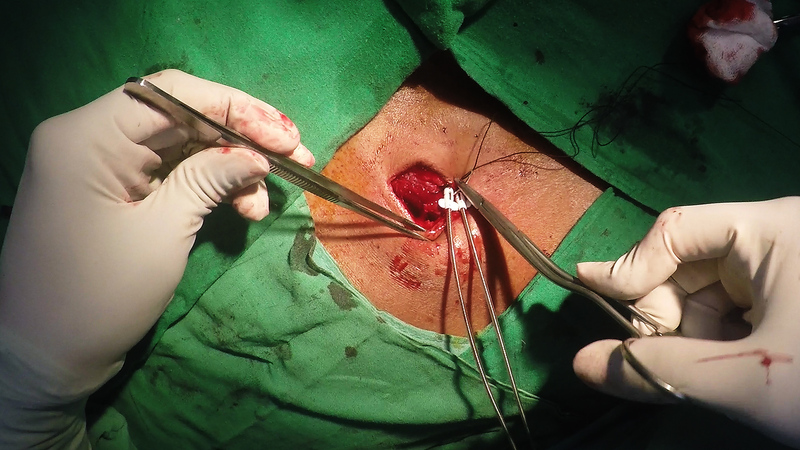 This layer holds down the device and prevents it from migrating along the tissue planes of the chestwall. It also envelopes the leads and prevents them from moving. Thus the role of the sleeve is to hold the leads until the enveloping layer of tissue forms around the lead. 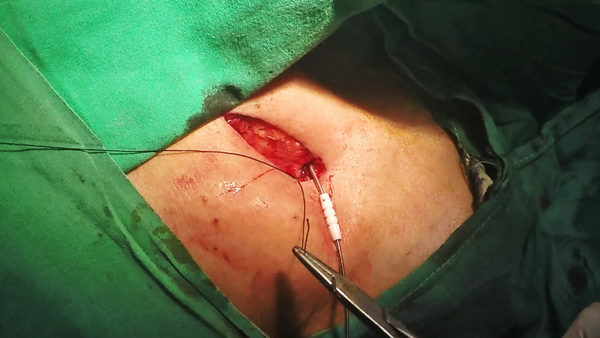 Suturing of the sleeve includes two steps : suturing the suture to the pectoralis muscle (the muscle bite) and encircling the sleeve it self. From a practical point of view, the most important factor of a sleeve is the softness of the material in which it is made of. 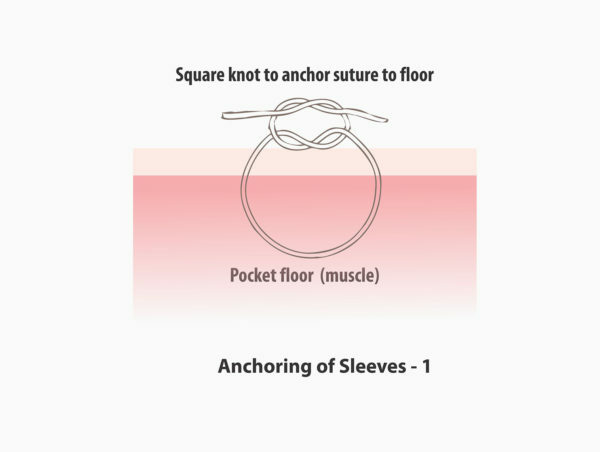 More stiffer the material (e.g St Jude’s Sleeves) higher the chance of non-tightening of knots and slippage of suture. In author’s experience, Biotronik has the softest sleeves and St Jude Medical at the other end with Medtronic and Sorin in between. 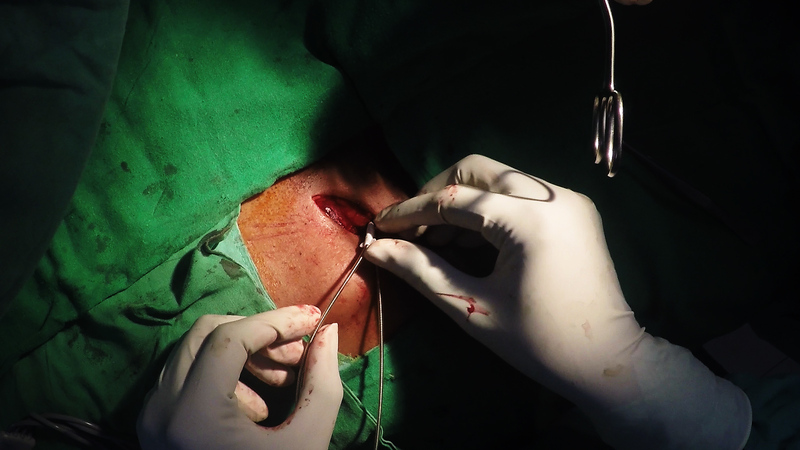 Before going in to details of suturing, its important to identify components of a sleeve : It consists of a hollow tube (Inside in which the lead runs through) with grooves on the sleeve body to place sutures. Some manufactures sleeves have “wings” for additional sutures. One must especially be careful with St Jude sleeves as they require a significant force from the knot to hold the lead in place. Suture materials can be either absorbable or non-absorbable. We use both depending on availability but prefer absorbable over non abosorbable. Theoretically, any material that will last for 6 weeks would do as the sleeve’s only role is to facilitate capsule growth over the lead. 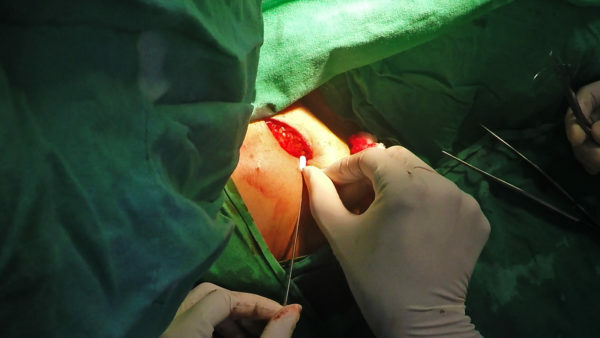 When one uses non -abosorbable material, the suture material itsleft can last years and if the material is black silk, then the infection risk (by entrapped bacteria) is also high. Although it lasts more than 4 weeks, the tensile strength is lost by 50% by the fourth week and essentially none by 8 weeks. The braided vs. unbraided material: Some generic Vicryl preparations are upbraided and knot retention of these sutures can be very flimsy. For suture security, several knots (at least 8!!) 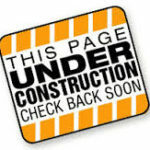 are required – otherwise they slip in front of your own eyes. Furthermore, precise knotting technique is necessary to prevent slippage (i.e. 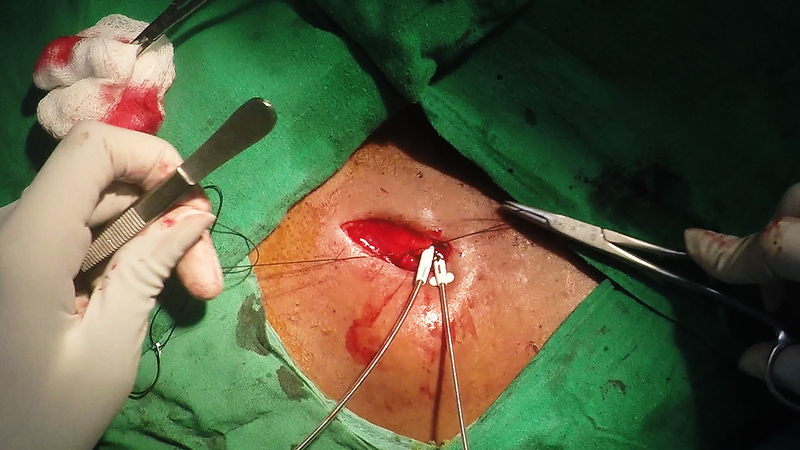 properly placed surgeon’s knot). Silk : Silk has excellent knot holding capacity and is forms very durable knots. 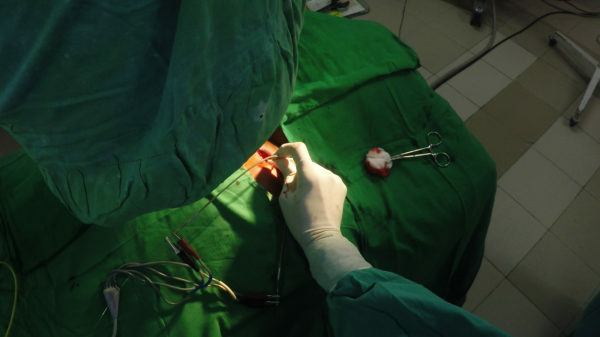 However, one important fact to be kept in mind is the risk of retained products and infection – because a silk suture consists of fine fibers woven together (actually that is the fact that gives silk its unique handling properties). Therefore when choosing silk, it is necessary to reduce suture bulk by minimizing knots and limiting size to 3/0 or 2/0. Although silk is classified as non-absorbable, the manufacturer states that silk is essentially lost after 1 year from enzymatic degredation of its components -but from a practical point of view, silk does last for a long time – some times up to the next device replacement where the device anchoring silk stitch may be still present. First pre-requisite is that the lead be fixed actively at the target site (i.e. Ventricular or atrial myocardium). The parameters should be acceptable. After removal of the peel-away sheath, the lead should be exiting the pocket at its floor – well away from the skin. 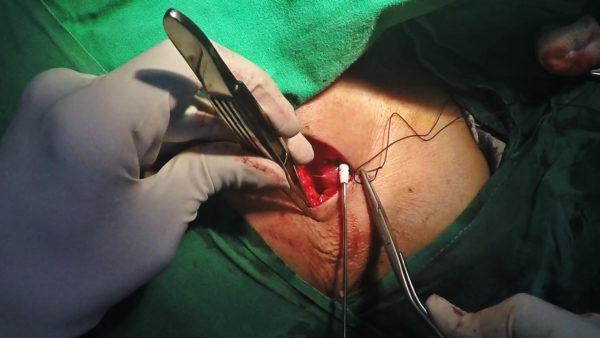 This step is most conveniently achieved by paying attention to where the guide-wire is before inserting the sheath (at the initial stages). If the guide-wire is well away from the skin edges, the subsequent lead will also take the same pathway. Before commencing of suturing, it would be nice to have an own rhythm or a paced rhythm from a temporary wire rather than the new pacing lead. 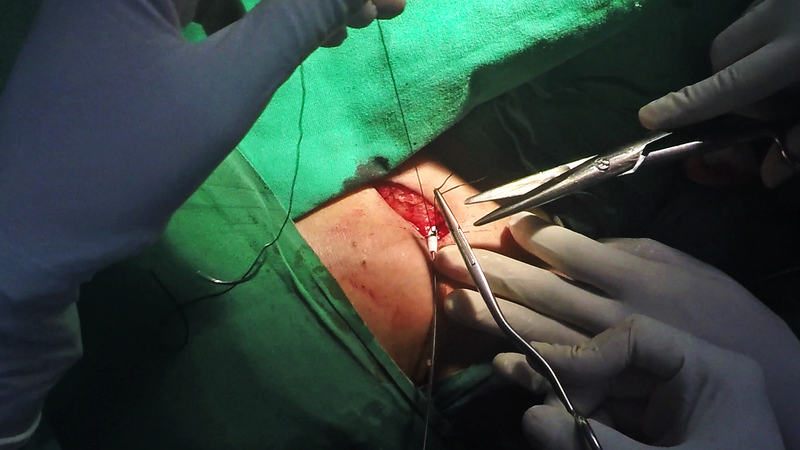 Sometimes during suturing, if the suture breaks with force, it may yank the lead and dislodge it from the active fixation site leading to loss of capture. Therefor its always safer to have an independent rhythm which is not dependent on the new pacing lead. 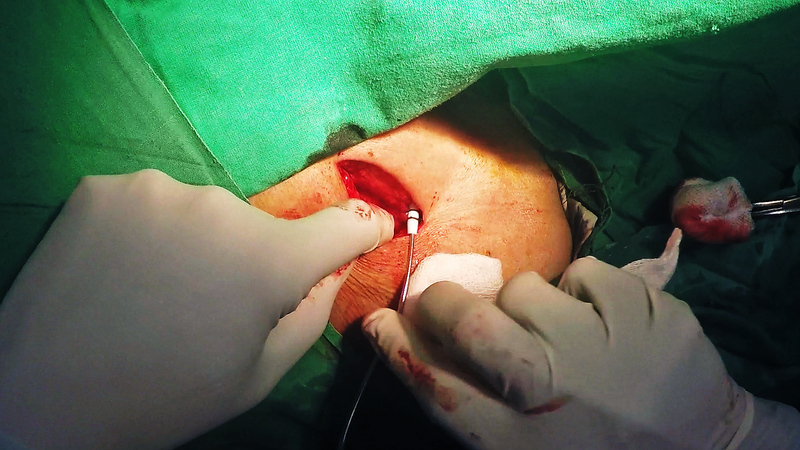 A stylet should be inside the lead before suturing – for two reasons, Firstly, it is extremely difficult to keep the sleeve in place without any additional support to the lead and Secondly, the stylet provides safety from lead kink/ damage, if excessive force is applied to the sleeve during suturing. 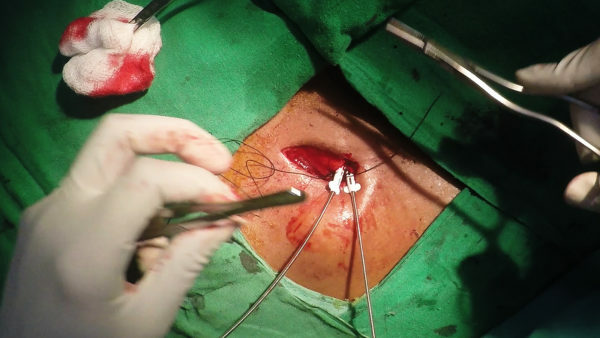 If the original 3D stylet is still in place, it should be withdrawn halfway (having it just beyond the pocket floor is enough for suture support). If it is completely taken out, a straight stylet should be inserted HALFWAY for lead support. 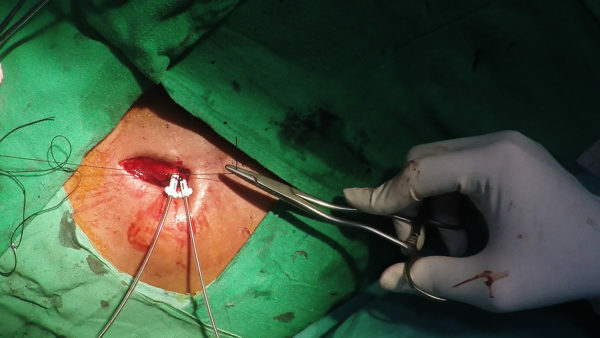 One must NOT insert the straight stylet completely as it would straighten the lead and cause a dislodgement at the active fixation site. 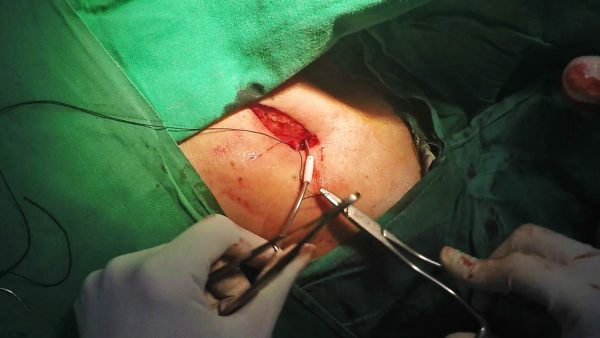 First, a bite is take from the pocket floor (pect major muscle) – under the sleeve and should be generous (at least 1 cm of muscle incorporated). 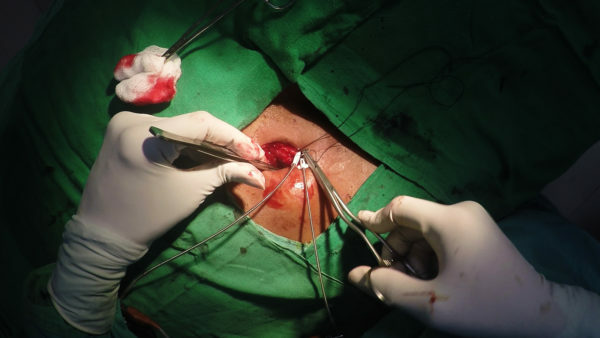 A knot is applied to tighten the muscle bite – this should be NOT too tight as a too tight knot will lead to muscle necrosis is and loss of support. Absence of muscle wrinkling after tightening the knot will indicate that the knot is not too tight. The knot itself should be a square knot just tight enough to keep suture anchored to the muscle. The knot will also prevent tension coming to the muscle once the suture is tightened over the sleeve. Figure : The knot to the muscle floor – A conceptual overview using a dummy. Only a single square knot is necessary to anchor the structure to the muscle. Multiple knots at the floor should be avoided to minimize retained suture. 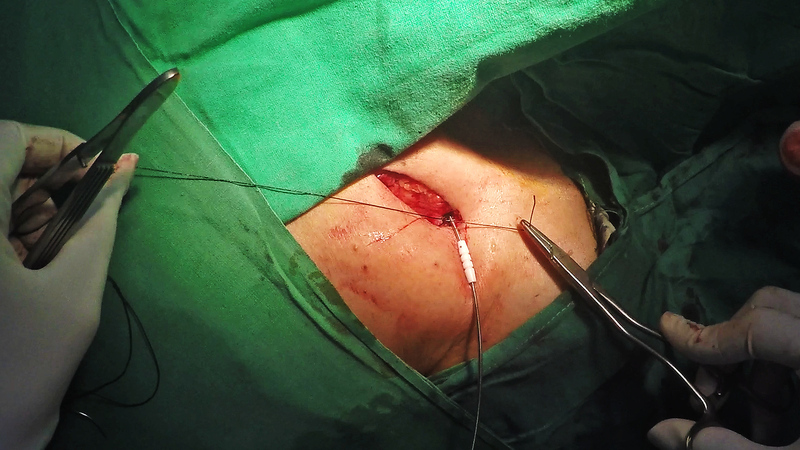 Thereafter, as shown, the suture is taken around the sleeve and a knot is applied to tighten it around the sleeve. The suture should be placed within a groove of the sleeve that is just visible and near the floor.  The knot should be a full surgeons knot. Just before tightening the first loop, a radiologic assessment is taken to ensure that adequate lead length is left inside. (i.e. the lead should be a lax curve within the cardiac shadow) If the lead needs adjustments, it’s done before the knot is tightened. Thereafter the first loop of the knot should be applied with force (using hands if necessary rather than a needle holder) as this is the most critical knot to keep the grip of the sleeve to the lead. It also has to be a surgeon’s knot to ensure that it does not slip during knotting. After the first knot, few additional square knots are applied for security – for silk we 2 -3 knots and for unbraided vicryl, about 7 -8 knots. Figure : The knot to the sleeve – A conceptual overview using a dummy. The first of this knot has to be a surgeons knot to avoid slippage after the fist knot. 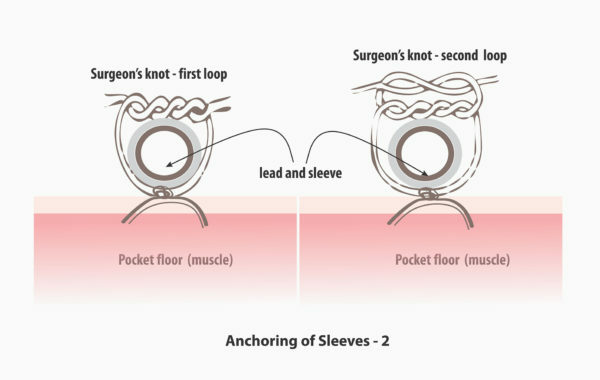 (The surgeon’s loop prevents slippage before the subsequent knots are applied). A single throw square knot may slip before the other knots are applied and therefore not recommended as the first knot. The next few knots can by square knots. About 3 such are adequate for silk, but 6 to 7 are need for unbradied vicyl for knot security. 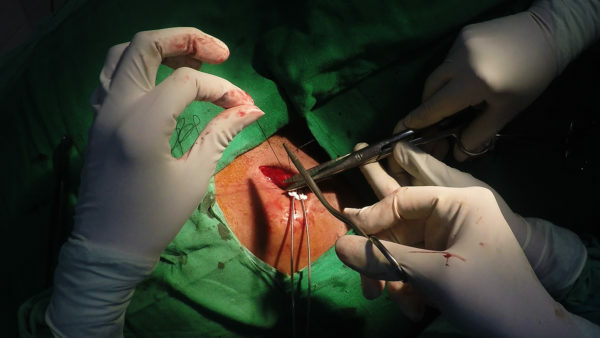 Once both sutures are have been placed, a gentle tug is applied to the lead to check for proper grip. The stylet is kept inside until you are ready to attach the device. Take a muscle bite under the lead/sleeve. It should encompass about 1 cm of muscle tissue. Take care not to prick the lead !! Now place a square knot and tighten the suture. 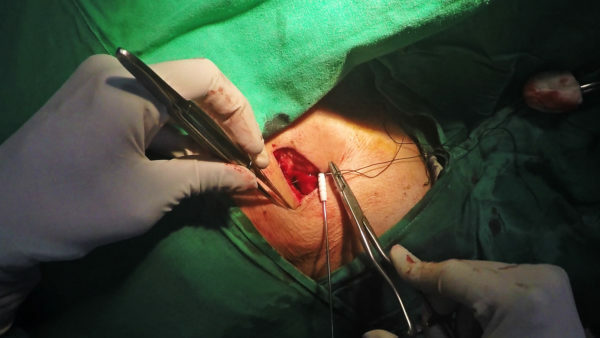 It should not be too tight – otherwise muscle might necrose. Avoid more than one square knot – too many knots increase the risk of infection. 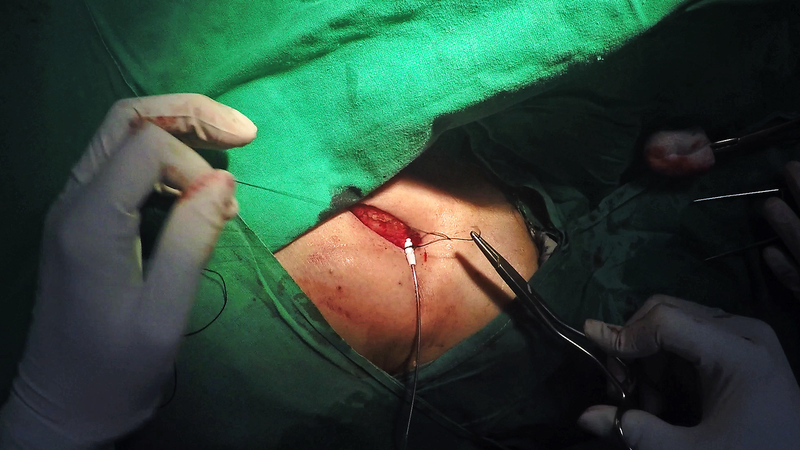 Apply the first loop of the surgeons’ knot but do not tighten it full. Recheck radiographically as to whether the lead is in correct place and verify adequate length is inside. 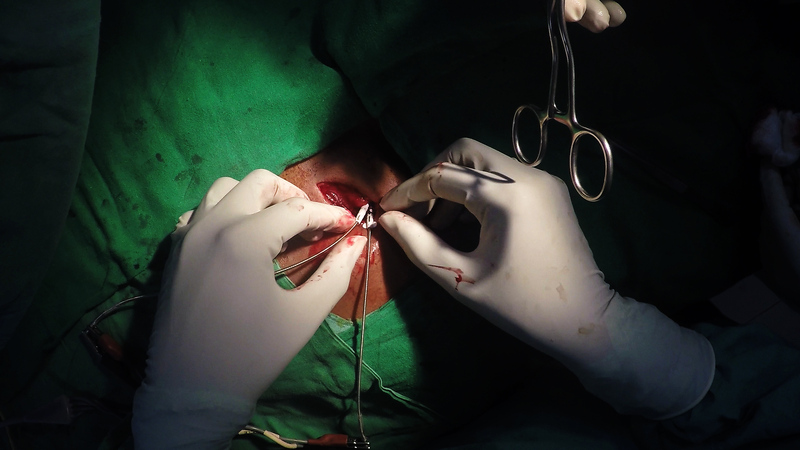 Cut off the excess suture. A stitch is applied to the second groove in a similar manner. After suturing both grooves, gently tug on the lead to see whether anchoring is secure. Slide the sleeve into the pocket floor. Note that by convention (and some logic when lead curvatures are considered), the medial lead is the atrial lead. 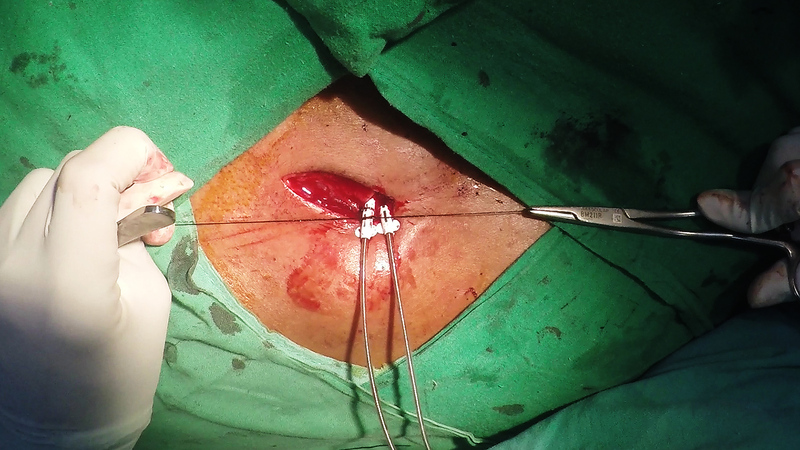 If an LV lead is also inserted, it is usually placed etither medial or lateral depending on space availability. Using a standard approach prevents lead interchanges. 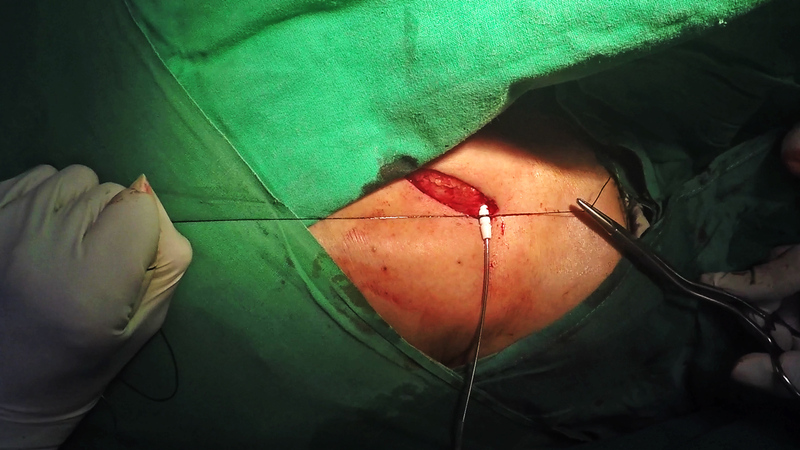 Now take the suture under the sleeve and position the sleeve in the pocket floor as to have the proximal groove hidden in the pocket floor. We will be suturing the distal two. 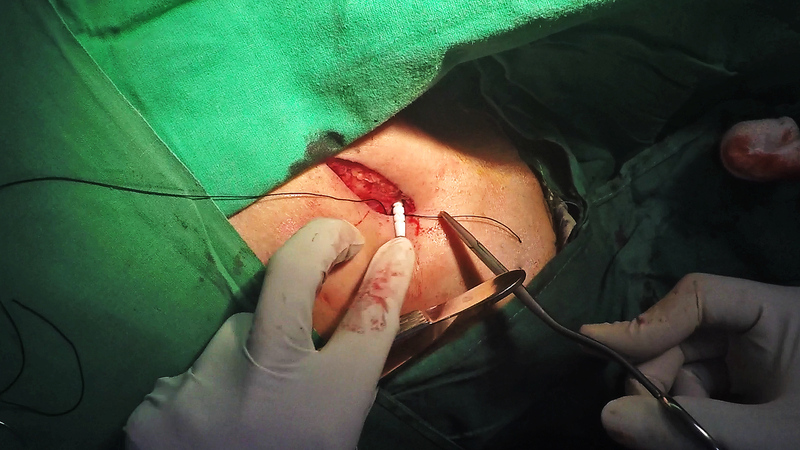 Take the suture under the sleeve and apply the first loop of a surgeon’s knot without fully tightening it. Apply stitch in a similar manner to the next groove. Figure : Example of a erosion occurring at sleeve site, 3 years after implantation. 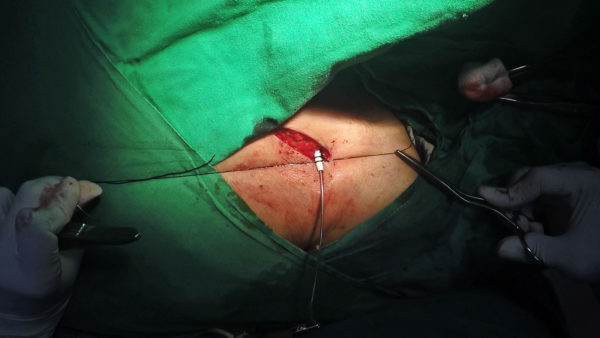 In this particular case, multiple factors would have helped the lead erode : Too close to skin incision, sleeve not in wound pocket floor & possibly long retained silk sutures.